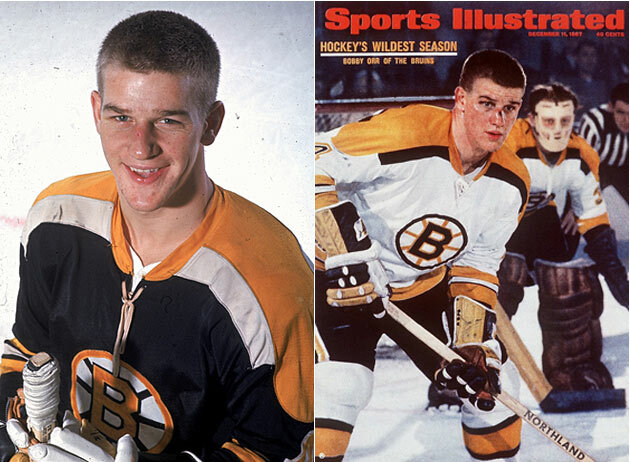 Bobby Orr's arrival at age 18 saves the Boston Bruins: a 1966 Sports Illustrated feature by Frank Deford. As the 2015 NHL Draft and the arrival of two potentially generational players, Connor McDavid and Jack Eichel, loom, SI.com looks back at other notable teen phenoms with a series of features from the SI Vault. The sixth installment is this story, which originally appeared in the October 17, 1966 issue of Sports Illustrated. Links to the first five—Sidney Crosby, Eric Lindros, Mario Lemieux, Wayne Gretzky and Guy Lafleur—are below. Subscribe to SI magazine here. Special Championship Offer: Get a Commemorative Chicago Blackhawks Book and Framed Cover. The ice will soon be forming on Parry Sound, and within the month it will conquer the green waters that lap at the Thirty Thousand Islands and hold them tight until the thaw, late in April. In this long winter the harbor will, as always, belong to the kids from town and to their hockey games. They will play every day—against each other or against the Indian boys from Parry Island who come onto the ice with freshly cut saplings for sticks. The temperature there, 160 miles north of Toronto, falls to 40 below sometimes, and the ice can measure three feet deep. The games on the sound are hard. You don’t get to play much unless you can grab the puck and keep it. Bobby Orr learned to grab a puck and keep it on Parry Sound. He is only 18 now, starting his rookie year with the Boston Bruins, but many people think that before long he will be controlling games in the National Hockey League as surely as he did those against the Indian boys. Almost from the beginning Bobby Orr has been able to dominate a hockey game. When he was working nights, Doug Orr would come down to Bob’s Point during the day and watch his little son play. He would see Bobby dance on the ice among the bigger boys, going between them and around them, steering the puck all day, it seemed, until the great shelves of bubbly black clouds would begin to move in on Parry Sound and the snow would start to fall, racing the early northern darkness to the ice. For years now hockey fans in Boston have been nursing a vision of Bobby doing the same thing on their ice, for Orr comes to the NHL as the most ballyhooed and highest-paid rookie in hockey history. The Bruins have not made the playoffs since 1959, so they have promised the fans, more and more, that Bobby Orr would be there soon. Then the Bruins would lose another game, and the crowds, grumbling, would fall out of the Boston Garden into the dark of Causeway Street and stand there under the el and talk of Bobby Orr and the day when he would be there. When Orr was only 12 years old, 5' 2", 110 pounds, he already was being courted by two NHL teams. By 14, he was signed to an amateur (Junior A) contract that, in effect, bound him to the Bruins for the rest of his natural life. Significantly, he is the last of that era. Expansion in the NHL has put an end to such indentured servitude, and pro teams will no longer be able to control young prospects. At 14, Orr was assigned to the Bruins’ club at Oshawa, Ont. There, playing against men of 19 and 20, he made the second All-Star team. He probably would have made the first, but his mother would not let him live away from home, so he never practiced with the team and had to commute to Oshawa, three hours over the wintry roads, for every game. He weighed 127. After a long summer of bitter negotiations, Bobby signed for the big time aboard Emms’s yacht at Barrie, Ont. at 2:30 a.m. Saturday morning, September 3. The contract—a bonus and two years’ salary—came to something like $540,000. However parsimonious that may sound in relation to other sports, it is much the largest a hockey rookie has ever obtained. Laughing, Doug and Bobby got in the car and drove back up to Parry Sound. The Orrs’ large stucco house is set hard against the base of Tower Hill, looking out past a railroad spur line and over a freight shed to where the Seguin River tumbles white water into the sound. Nearby, the Canadian Pacific rumbles overhead on one of the largest trestles east of the Rockies, whose man-made ugliness dominates the town and makes it suffer even more because of the largess of God’s beauty all around. Nothing in Parry Sound escapes that trestle. Its foundations are set as strong in Tower Hill as they are in Belvedere Hill, across the river. The richest people in town live on Belvedere Hill, which has the best view of Parry Sound. Bobby worked up there one summer as a bellhop at the old Belvedere Hotel. There are 6,000 people in Parry Sound. “The kids grow up and leave,” Douglas Orr says. He works at Canadian Industries Ltd., an explosives firm, loading crates. Tourism is the town’s major source of income, but Parry Sound is no raucous resort; there are few distractions. It is just a sad, friendly little place, the kind of town where the men stop to peer carefully into hardware store windows and where the pretty girls turn fat before they grow old. It is a good place to play a lot of hockey. The Orrs live in a house that is comfortable enough for a family with five children, but it is an old building and, even in the harbor cove, it is not sufficiently protected from the harsh boreas, a wind so strong that it has set many trees in the Parry area permanently outstretched to the south, as if frozen in some desperate plea for help. 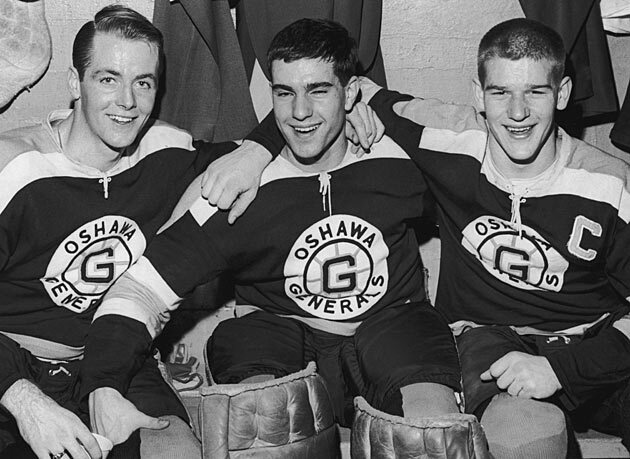 The Orrs are a close and demonstrative family, and Doug Orr became used to hearing his wife and oldest daughter, Pat, bawling in misery over the phone when Bobby first moved to Oshawa. Often Bobby would cry back. One time that year Mr. Orr’s younger sister, Mrs. Margaret Atherton, was in the first row at the Bowmanville rink when a hometown player named Chuck Kelly knocked her nephew Bobby into the boards right beneath where she sat. Margaret lashed out, screamed, “Brute!” at Kelly and pasted him a solid blow on his forehead. Bobby skated clear. Bobby worked that summer at his uncle’s butcher shop on James Street. Slicing bacon, he almost cut off the knuckle of his left thumb. His uncle paid him in cash and all the steak he could eat. 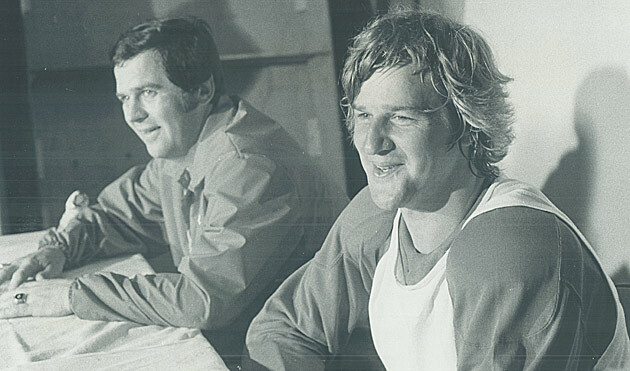 Doug and Bobby Orr are as much pals as father and son can afford to be—and, at 41, Doug is, after all, only three years older than Gordie Howe. But within their covenant, the more significant traditional responsibilities—respect for the father, guidance for the son—are never forgotten. There is also more than the normal paternal pride brimming in Doug Orr. There are the memories of Doug Orr himself on the ice, and that painful click of might-have-been. Doug was 17 in 1942, quick and good, and the handsome young bridegroom of Arva Steele from Callender, where the Dionne quintuplets were born. The hockey scouts were after him and Pete Horeck, another Parry Sound lad, but the war was on and Doug joined the Navy instead. By the time he returned, the chance had gone, for his family had started to arrive—Pat, who is 21 now, Ron, 19, Bobby, 18, in quick order; and later Penny, 15, and Doug, 12. None of the Orrs look much like each other, but they are all possessed of clear, bright eyes, quick humor and wonderfully natural smiles. Unlike most hockey players, Bobby can still smile through his own teeth. “I guess I’m just lucky,” he says. “The worst I ever had was my nose broken when I was 13. Why, I don’t even have 25 stitches and haven’t lost a single tooth yet—touch wood.” He bangs the table and smiles and smile he still can. Orr has been skating for as long as he remembers. After all, organized hockey in most Canadian towns begins with Minor-Squirt play for athletes under six. Then at six there are the Squirts, and after them the Peewees, the Bantams, the Midgets, the Juveniles and the Juniors, A, B, C and D.
When the NHL first stumbled upon Orr, he was 12 and playing in a Peewee playoff game in Gananoque, 300 miles to the southeast. On hand was one Montreal scout and a whole task force of the Bruins’ management, there to see two Gananoque prospects named Eaton and Higgins. These two were quickly forgotten as soon as little Orr materialized. Scout Wren Blair—now general manager of the incipient Minnesota North Stars franchise—was immediately dispatched to Parry Sound to donate $1,000 to the hockey program out of the goodness of the Bruins’ hearts. This in no way bound Orr. To do that, Blair had to get his signature on a Junior A “card.” Consequently, there were occasions when Blair detoured the entire minor league Kingston Frontenacs (whom he was coaching) into Parry Sound, just so he could get in extra licks with the Orrs. The Montreal man was calling, too, and Toronto and Chicago had begun to evince interest. So, as early as they dared, Boston gave 14-year-old Bobby a Junior A tryout. He was obviously so good that they began to implore the Orrs—even to the point of trying to get Doug drunk—to let Bobby sign. But not until Blair suggested the compromise of letting Bobby commute to Oshawa would Mrs. Orr agree to let her little boy play. The deal they finally agreed on included $52,800 for Mr. Orr—some of it clear, some of it to stucco the house and to buy a second-hand car. The Bruins also promised to buy Bobby some new clothes, but they kept forgetting about that. The next time the Orrs negotiated, they had a lawyer at their side. The Bruins could not understand why. But then, at 14, Bobby was on his own, for when his parents decided to let him play they permitted him to make the final decisions. 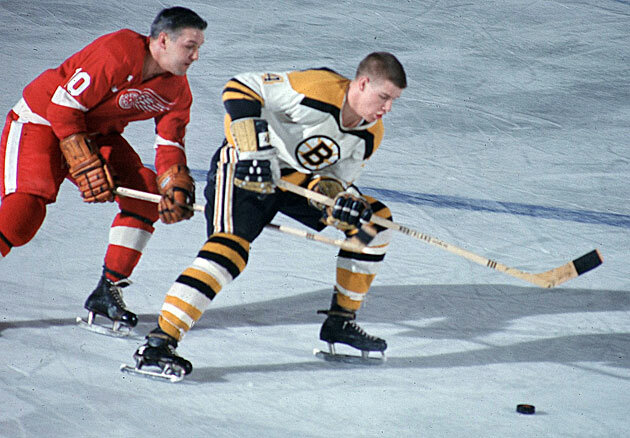 “I knew he was only 14,” Mr. Orr says, “but I felt that he deserved to make up his own mind.” And so, on Labor Day of 1962, while his parents watched, Bobby Orr signed his Junior A card with the Boston Bruins, there on the kitchen table in his home on Great North Road, Parry Sound. Boys his age had signed before, but most had been early to develop physically, not so immature and small as Bobby was. Bobby was a sudden star and natural leader. His game improved each year, but much of his talent is still instinctive. He seems to have a magic facility for heading toward an empty spot and attracting a loose puck toward him. He is not only a remarkably fast skater—in Parry Sound they say only his father could skate faster—but he bursts. He starts full speed. As his scoring records indicate, he owns a fantastically hard shot from the point. He is at least as apprehensive about living up to all the fanciful expectations, for he knows that the beleaguered Boston fans have every right to expect too much of him. He knows they have been waiting for him for so long. “I guess there’ll be a lot of sleepless nights for me if I don’t live up,” he says. Hopefully, the fans will understand that the kid is, after all, only 18. People who have been stars in any professional sport at that age are rare—as rare, say, as Bobby Feller. If Orr can merely hold his own, that would be a worthy enough achievement for this first season. But then, his contract has already given him one significant accomplishment. The NHL establishment is not known for overpaying those in its employ. The Orrs, however, knew how the Bruins had advertised Bobby back in Boston. They had a bargaining point. And they had a Toronto lawyer named Alan Eagleson, cool and coony, to bargain for them. Eagleson has the owners in a perfect fit, for he negotiates for 30 NHL players now and is getting them all more money. The NHL bosses suspect conspiracy and accuse Eagleson of “wreaking havoc” upon their league. Eagleson protests. For his part he has merely requested that he not be thrown into the briar patch. So after the Bruins tossed him in there a few times he came up with the record contract for Bobby. The adventure, all of it, meant as much to Bobby Orr, growing up, as it did to Bobby Orr, remunerated hockey player. “I learned more in the last five months about people and life than I ever did all before. I learned a lot of things I never knew. “Oh, boy,” he says, laughing at himself. “You should have seen me sometimes at Oshawa. I’d go in to see somebody, and I knew what I wanted to say, but then they would start telling me things and turn it all around. They would tell me things that I knew were wrong—I knew they were—but I would just sit there and agree.” He shook his head, madder at himself than the memory. Little Dougie, his kid brother, who is adolescently thrilled and exhilarated about Bobby, sat up, stunned at this revelation of human failing.